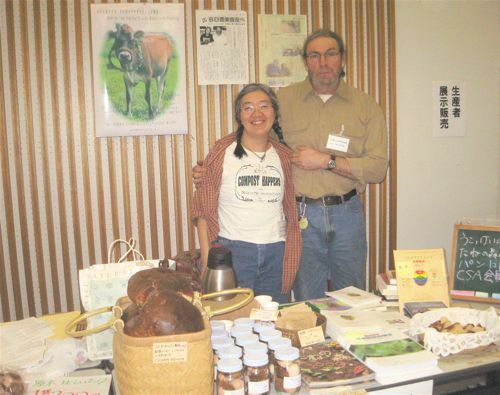 Some of my ideas for how the Tokachi gov't can help the organic movement in Tokachi. One idea is to educate the schools about what is organic agriculture.This can be done with a slideshow presentation followed by a farm tour to some of the Tokachi area organic farmers.The slideshow should be presented in every high school and college in the Tokachi area and later to other parts of Japan.It will take several months to put a good slideshow together.The government can talk to the schools and get their permission and compensate the presenters expense's such as slideshow materials and gas,etc.We will need an audition and review with the school and government when we are ready.We hope the Tokachi organic network can benefit from this idea not only financialy but as publicity too.The slideshow will consist of organic methods we are useing and some places where they can learn more about how to grow organically and where they can buy organic products and why it is healthy for you and our planet.We will try not to condemn the chemical farmer as much as possible. Another idea is to make a place for formal training for new farmers i.e an organic school.Konomi is heading up this project with ideas from an organic school in Shi ko ku island. 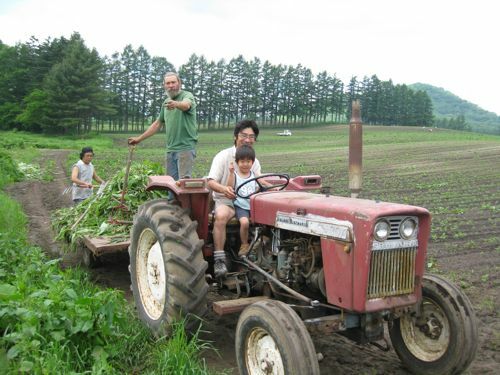 Another idea is an apprenticeship placement program for new farmers who are looking for their first farm.For older farmers near retirement that are willing to turnover thier farm to an organic new comer they will work together in transition from conventional to organic production with support from the Tokachi government and the Tokacho organic network.The government can subsidize both farmers and help to create a market through JAS or any other system that is agreeable to the farmers.We can work with Honbetsu city hall to get these empty fasrms filled with organic farmers and use the empty school to start our organic school.Honbetsu has many oppurtunities for growth in the organic movement and we can help and the town can benefit as well. Another idea is to improve the experimental or research centers.We need to know what is going on in there.Let us participate as research farms come and look at what we are doing and learn from us.We can work more closely together.The reasearch centers need a qualified organic farmer not just a scientist. Another idea is to hire teachers to teach organics in the schools.We can teach until the school finds someone to take our place.The Honbetsu college is close to us if you can talk to the school we can teach there and at the agriculture high school. We are already conducting workshops and have plans to start our own school.We want to train apprentices and have help from our city hall to get our graduated apprentices a farm near us that can takeover a retireing farmers farm and convert it to organic/biodynamic methods.Somehow we would like some support during this transitional period.We will need help from people who are not farmers.We are farmers trying to farm and help the organic movement.Can the government pay someone to help us with this movement?As a biodynamic farm community we can help the organic movement with producing a lot of organic/biodynamic food and set a good example of growing our food and teaching while living a healthy family lifestyle.How can the government help someone who has graduated from an apprenticeship program or an organic school local or abroad get his first farm and get help converting the farm during the transitional period?How can the young people find out where to go for organic education?Why not have an organic teaching team to visit each school in the Tokachi area and later other parts of Japan.Why can't the government hire someone to do these things or pay the Tokachi Organic network to do it through someone we choose?Does the researh center have qualified organic farmers to do their research?What help can we give to the research centers to help make organics work like it is suppose to?Do they experiment with biodynamics there?Need someone to do that?Maybe we can help there too.How is the best way for the government to help us with the organic movement?Do you have any other ideas or suggestions?We don't have much time to go into much details now but we can give them our ideas and see if they do something with them.One thing they must know is that this organic movement is going forward with or without the governments help.It is inevitable.The world is slowly changing to enviromental issues and cocerns for the future.We in Japan want to help too.Obihiro is a green model city,organics is green.Lets make the Tokjachi area an organic model for Japan and the world.Please tell us what we can do to help?What more can we tell the government?I'm new here and don't know how to help.I am willing to do whatever i can to help save our planet.Biodynamics is my way. Thanks for the comment.Nakafurano is still an organic town and growing everyday to be all organic.Keep up the good work there and we will make all of Hokkaido organic.Our meeting with the Gov't went well we got to meet who is who and where they are and what they do.It is a good start to forming a good relationship with them.Hope you are well.Love Ben.